Big Blue DFW: Unrestricted Free Agent - MLB Paul Posluszny ? Unrestricted Free Agent - MLB Paul Posluszny ? This kid is 26 years old, 4th year MLB out of Penn State and an unrestricted free agent 2011. He is said to have an excellent football IQ and ability to shed blocks. Had 151 tackles, second to Jerod Mayo last year and in excellent company to be compared to Mayo. 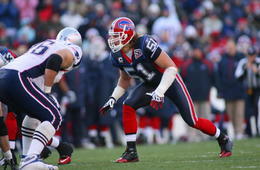 This Posluszny, "Poz" as they call him in Buffalo has played for none other than Perry Fewell. Might be a nice fit. Posluszny may even like ole Perry Fewell. Bulloch is most likely gone and at 80 tackles, Goff is still developing. "Hey Poz, come down and play for the real NY team. Play with the Big Boys in Big Blue." MLB- Dhani Jones- Cincinnati Bengals- a re-tread yes, but he was a decent Giant. MLB- Stephen Tulloch- Tennessee Titans- Tulloch put up 111 solos for Tennessee. What do you think? Keep Goff at MLB....Free Agency...Draft? All I know is its that time of year to think about Free Agents and Draft picks. January 24, 2011 at 12:00 PM CST- Peter has EXACTLY 49 DAYS to make his infamous pick. Hey Big Blue, its me. Tony form Lodi. This guy is from Beaver County.get it? Beaver County. it's beautiful thing that beaver country. Draft Mark Herzlich Outside Linebacker Boston College. A Reach in second round most likely in 3rd round or later.